Positives: Was claimed off waivers from the Padres (a nice little reversal from how player activity usually goes between the two teams) and, after a month at Memphis, made his Cardinal debut July 29 after the bullpen overhaul….was unscored on in his first 10 innings (eight appearances) for the Cardinals….lefties hit .238 and had a .741 OPS against him….had a 3.65 ERA in home games….batters hitting leadoff went 1-9 with four strikeouts….the first batter he faced had a .511 OPS….allowed a .624 OPS with nobody out….batters hit .200 with two outs and runners in scoring position, though he did walk four in those nine plate appearances….had a .735 OPS in low leverage situations….had a 0.00 ERA in three games against the Cubs, though he did allow two unearned runs….had a 2.00 ERA at Busch Stadium….had a 2.29 ERA at Memphis. Negatives: The last five runs he allowed were unearned, though that might be more oddity than negative fact….righthanders hit .324 against him….allowed two of his three homers to lefties….had a 5.63 ERA on the road….threw only five innings for the Padres (with a 12.60 ERA) before being sent to their AAA affiliate….second-place hitters had a 1.711 OPS against him….batters hit .545 with a 1.273 OPS on the first pitch….they hit .429 when the count was even….walked six batters in 22 plate appearances with runners in scoring position, compared to just four strikeouts….batters had a 1.417 OPS in 12 high leverage plate appearances….had a 7.11 ERA on zero days’ rest….had an 8.44 ERA in day games. Overview: I remember thinking during the season that they should use Webb more, as he seemed to be someone that could come in and get jobs done, even if you didn’t want him in the hottest of fires. Looking more at his stats, you’d be forgiven if you thought that much of his success was smoke and mirrors. When your FIP is two runs higher than your ERA, that’s telling. When you don’t strike out more than twice as many as you walk and you don’t strike out a batter an inning as a reliever, that’s kinda telling as well. If those five unearned runs had been earned, you are looking at a 4.70 ERA. While you can’t assume that to be the case–the defense plays a large role in those being unearned, after all–that sort of ERA might have been more in line with what Webb was actually doing. Even with those unearned runs, he had a 5.06 ERA after that stretch of scoreless ball and he allowed 56% of his inherited runners to score. Actually, looking at this, I think a B might be too generous. Outlook: Webb’s still on the roster and as desperate as the club is for left-handed relief, he’ll probably get a shot in the spring to see if he can do something. 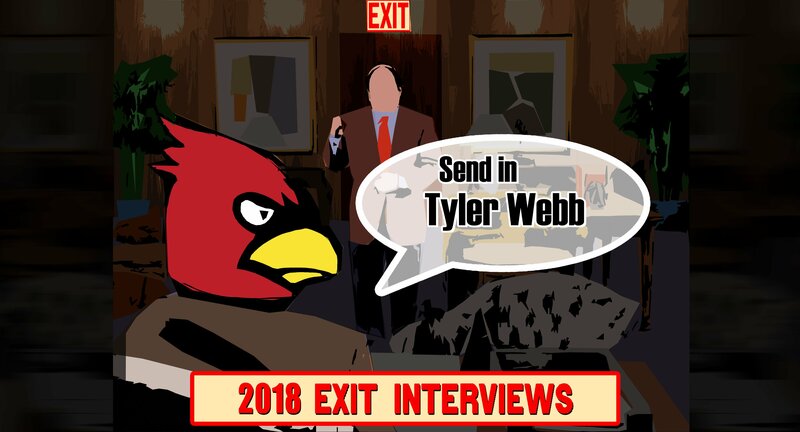 That said, if the Cards sign or trade for a lefty and can’t lose Brett Cecil‘s contract, Webb might be the one let go to see if he can clear waivers and go back to Memphis.